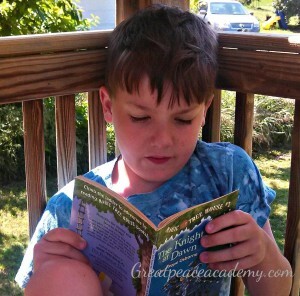 After five years of homeschooling, we are half way through our first ever summer schooling session. This option had never been in my plan of action, but my son decided he wanted to keep working through the summer. What homeschooling mom in her right mind could argue with that? Instead of complete school days, we are studying several hours a week with time off as needed. We have no solid schedule, and we are being very flexible. That being said, I have just begun to realize that I never had time between school years to focus on the upcoming academic year. So now, I’m turning my focus from current learning goals to goals for next year. I have put together a plan of action so that I will stay motivated to focus on next year while trying to continue working through the summer. Pray. When starting off any school year it is best to pray for wisdom to teach and guidance to fulfill His leading. Decide when the summer school session ends and the new year begins. (If it hasn’t been completed, make sure your homeschool notification is sent to the school district). 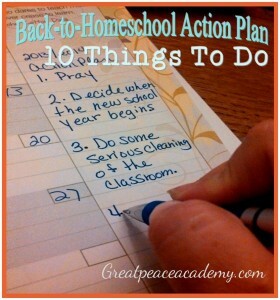 Do a serious clean up of the homeschool classroom. Pull down wall displays that are no longer relevant. Re-organize set up for easier work flow as necessary. Inventory school supplies and determine what needs to be bought. Go through previous years’ curriculum. Determine what worked and what didn’t. Make some decisions. Determine if those that didn’t can be altered to fit your needs. Decide what is getting pitched and what is staying. Work on your lesson plan book. Fill in the calendar dates. Determine if there are any gaps in your curriculum plan, and purchase any needed material. Go through each academic subject and make a list of any additional resources or supplies that might be needed. Make a plan for when those supplies will be purchased–whether before school starts or in the quarter they are needed. Beginning printing and copying lessons. Put together notebooks, file folders, and lab supplies. By having a plan of action, I know that I can focus my energy in the right way. I can prepare for the upcoming school year with my goals clearly outlined before starting the academic year. Have you done planning for fall 2013? Does your process look like mine? Thank you for sharing your plan of action with us. Mine looks similar, since we will be starting year-round schooling this year. I am definitely going to use your planning list. Have a blessed school year! I’m so glad you are finding it useful. It has been a learning curve for me for sure this year around school. I’m working through these steps. The classroom has been cleaned up and I’m starting the going through the curriculum process. We usually school year round, just lighter in the summer. This year included Vocabulary Spelling City’s summer program (came with a free premium membership–whoo hoo! ), lots of book reading, trips, and some Teaching Textbooks. My process is very similar to yours, as a matter of fact, it is the same system I used when I was in the classroom. Guess some things never change. This year my daughter is going to use Time4Learning’s new high school program and whatever supplements we choose. I must say I haven’t put in as much time on choosing the supplements yet because I am been swamped this summer. Your post reminded me there isn’t much time left so I better get planning. Yes there isn’t much time left. I’m starting to really feel that myself. The plan of action is helping me though. I’ve gotten the classroom ready. Actually we did a total make over of the classroom. LOOKS great so now I’m extra motivated to get the curriculum planning underway.